Effective January 22, 2019 businesses in Hoboken will no longer be allowed to use plastic carry-out bags. Plan accordingly. In case you are unaware (and judging from recent conversations with our customers it seems many of you are unaware), the city of Hoboken passed a new law back in June 2018 which bans businesses from using single-use, carry-out plastic bags. This ban goes into effect on January 22, 2019. Customers will have to bring reusable bags if they feel that they need one to carry their food home. This ban will extend to delivery customers as well. While we will still be allowed to place your food into paper bags that meet with city guidelines, we will no longer be allowed to hand you your order in plastic bags. Instead, we will have to hand you the individual paper bags, taking the reusable outer bag back with us. We’re sorry for any inconvenience this may cause, but it is ultimately better for Mother Earth. 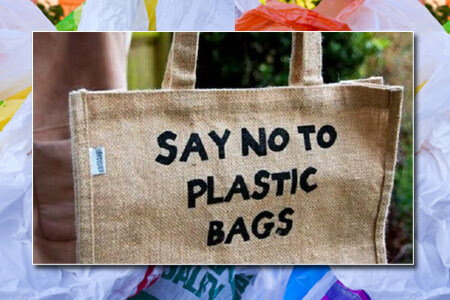 Single-use plastic bags account for the largest and most devastating portion of pollutants on the planet. We’re also looking into other ways to reduce trash in our world. It was a rude awakening for us to realize (and admit) that the food delivery industry is one of the worst culprits in plastic pollution. This plastic bag ban is a good start. We’ll keep you posted on our other plans. We also welcome any suggestions you may have. One obvious place to start is to no longer arbitrarily send plasticware, napkins, condiments, and so on with orders. We’re looking into ways to make it so the customer will have to request those items when ordering. Our assumption being that most people would already have these items (or most of them) at home or in their office. If you’d like to weigh in with your ideas, please comment via Facebook or Twitter. You can also email us or call us at 201-604-0054 if you wish. Bring Your Own Mug. Save Money. Pay with Rolled Coins, Get 5% Off!